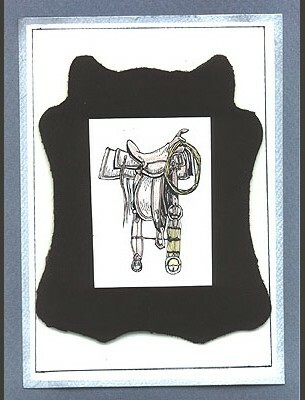 “Western Saddle” is stamped with black Memories on white card stock and colored with grey and tan colored pencils. The white card stock is layered on black suede leather which is layered on white card stock that has a black box drawn near the outside edge and has been edged with a silver Krylon Leafing pen. The final layer is grey/blue card stock. 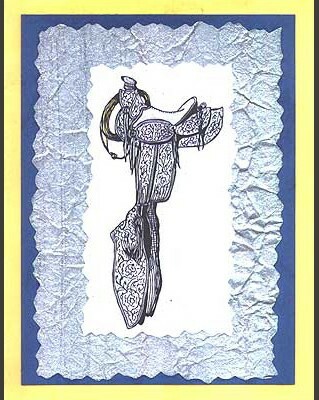 Card is by Mary Connaway who, also, drew the saddle. “Oak Tree. Lg.” is stamped in black Memories ink and colored with pencils. It is layered on dark green card stock, then over a strip of handmade paper and the last layer is white card stock. Card is by Mary Connaway who also drew the image. Tags: Colored pencils, Handmade Paper, Mary Connaway, Oak Tree Lg. 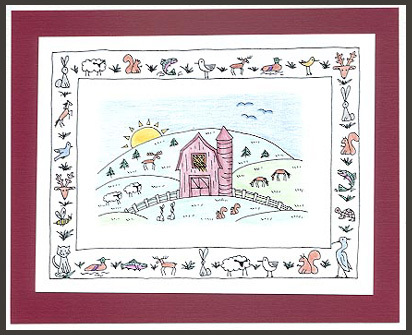 Stamps used are “Barn & Animals” and “Frame #22, Animals” and are colored with pencils. 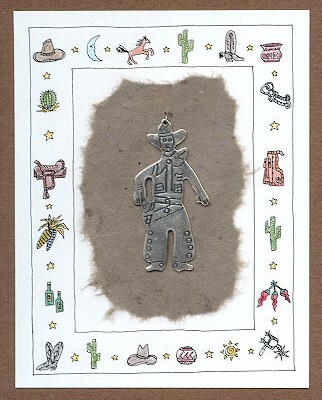 Card by Mary Connaway. 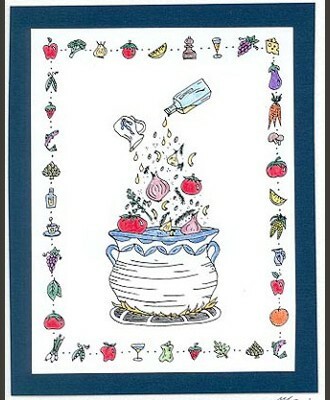 “Frame #19, Food” and “Soup Pot” are stamped on white card stock with black Memories ink and colored with pencils, then layered on blue and white card stock. Card by Mary Connaway who, also, drew the images. 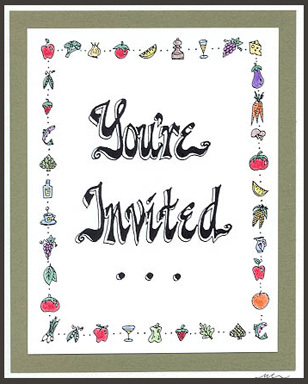 “Frame #19, Food” and “You’re Invited…” are stamped on white card stock with black Memories ink. 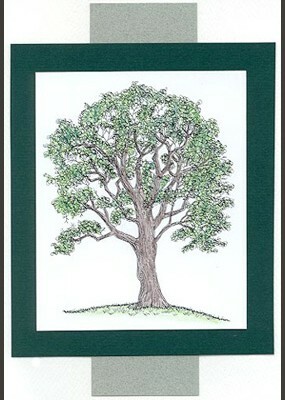 The frame is colored with pencils and the card is layered over olive green and white card stock. 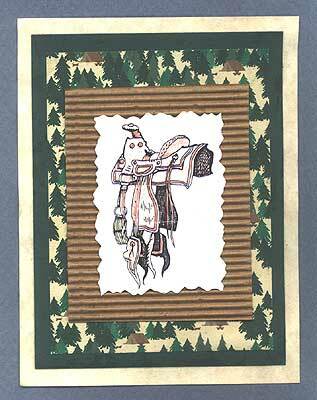 Card by Mary Connaway who, also, drew the images. 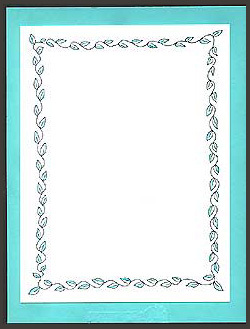 “Frame #3, Leafy” is stamped with a black memories pad on white card stock, colored with pencils and layered on background card stock. Card by Mary Connaway who is, also, the artist who drew the image. 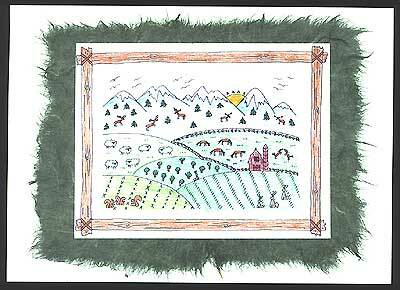 “Rolling Hills with Border” is stamped with a black Memories pad on white card stock, colored with pencils and layered on background paper that has been glued to white card stock. Card by Mary Connaway who is, also, the artist who drew the image.